"We have identified a minor issue in the Windows Phon 7.8 update and have temporarily paused delivery until it's addressed. "We'll have more information as it becomes available." No word on a restart date for the update rollout, but we'll keep you posted. If you're still waiting for Windows Phone 7.8 to hit your older Nokia Lumia handset, you may need some extra patience while Microsoft pauses its global rollout of the update. NDTV Gadgets reported Monday that Microsoft has indeed suspended the Windows Phone 7.8 update it started rolling out to older Lumia handsets at the end of January. The news comes by way of Nokia Russia's official Twitter account in response to an inquisitive Lumia 800 owner waiting anxiously for their update to hit. 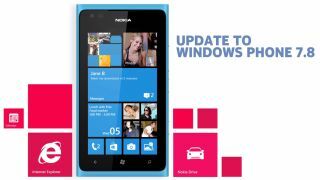 The Windows Phone 7.8 update is largely a cosmetic one, but early supporters of the platform have been eager to download it since Microsoft first started pushing it to Lumia smartphones on Jan. 31. While disappointing, the news is hardly a surprise - Microsoft Vice President of Windows Phone Joe Belfiore confirmed a reportedly "minor issue" with the update's new Live Tiles on Twitter back on March 3, promising a fix would be forthcoming. Vodafone Germany was actually the first to halt the Windows Phone 7.8 update, announcing the news on the company's message boards back on Feb. 23 without a specific reason for the delay. In addition to Live Tiles on the Start screen, the 7.8 update introduces Windows Phone 8-style branding and icons for Games, Office and Windows Phone Store, while also doubling the number of theme and accent colors to 20. Although users of older Nokia Lumia handsets will have to wait a bit longer, at least they know it's coming: Owners of non-Nokia Windows Phone 7.5 handsets are still waiting to learn if their devices will be eligible for the update in the first place. TechRadar asked Nokia for more on the matter and will update this story when we hear back.